Columbia hops on the Mono train with a new set of Bob Dylan reissues. They're also releasing Dylan's 9th volume of bootlegs entitled, The Witmark Demos: 1962-1964. The Original Mono Recordings are comprised of these albums painstakingly reproduced from their first generation monaural mixes as the artist intended them to be heard: One channel of powerful sound, both direct and immediate. While stereo recordings had been available as early as the mid-1950s, mono was still the predominant – and often preferred – mode of recording and mixing by the top artists of the 1960s. As a result, artists like The Beatles, The Rolling Stones and Bob Dylan devoted their attention to the mono mixes, leaving the stereo mixing process to studio engineers. 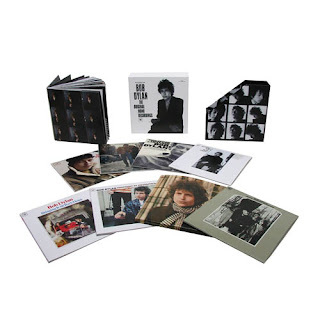 The Original Mono Recordings are accompanied by a deluxe booklet, featuring vintage photographs of Bob Dylan and an expansive essay from renowned author and critic – and longtime Dylan aficionado – Greil Marcus. Each disc in the set comes in its own individual jacket which faithfully replicates the original album artwork, complete with labels and stickers that were found on the original 1960s releases. Also includes a limited edition 18" x 24" Bob Dylan poster. The Witmark Demos are seeing their first commercial release on 2 CD in nearly five decades after they were first recorded. Listening to these 47 original recordings, one can trace Dylan’s dramatic growth as a songwriter from early traditionally-styled songs like “Man On The Street” and “Ramblin’ Gamblin’ Willie” through the social commentary of “Blowin’ In The Wind, “The Times They Are A Changin’” and “Masters Of War,” and the groundbreaking lyrical genius of “Mr. Tambourine Man.” All of these songs, and all the others on The Witmark Demos, were written – and their subsequent demos recorded – before Bob Dylan turned 24 years old. 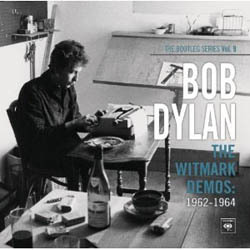 The Witmark Demos also features a deluxe booklet featuring in-depth liner notes by noted music historian Colin Escott, as well as rare photographs of Bob Dylan captured during the same period as these early recordings. Also includes an exclusive Witmark Demos t-shirt and a digital download of the complete album.